An Air Gap faucet requires a larger hole in the countertop than a standard faucet. Want to replace your air-gap faucet with a standard faucet? We've got an air gap adapter that makes the job a snap. The “air gap” faucet is a plumbing device designed to provide a siphon break for the drain line of an undersink reverse osmosis unit. If you have a filter, not a reverse osmosis unit, there is no drain connection and you do not want an air gap faucet. If you have a reverse osmosis unit, you may or may not want an air gap faucet. Air gap faucets have their advantages and disadvantages. The purpose of the air gap is to assure that no water from a stopped-up sink drain can possibly be forced or siphoned backward into your reverse osmosis unit via its drain connection. The air gap system accomplishes this by routing the unit's drain water upward to a small trough built into the base of the faucet, rather than directly to the drain pipe. The water then flows to the other side of the faucet stem, where it falls into a hole and drops by force of gravity into a 3/8" flexible tube, to the drain pipe. 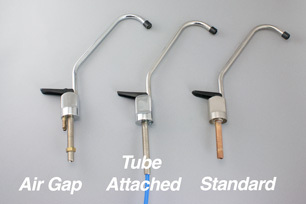 The air gap faucet itself requires, therefore, three tubes rather than one — one is for the upward drain water, one is for the downward drain water, and a third is for the unit's product water, which you drink. This means that it must have a wider base and will require a larger hole in the sink for installation. This also means a more complicated installation. The faucet itself has a small hole in its body so that water can flow out onto the sink or countertop should the drain tube become clogged. This is not an infrequent occurrence, since the drain water is not pressure-driven and even a small piece of food or other debris lodged in the inlet of the drain connection can stop up the line and allow the reverse osmosis unit's drain water to flow out onto the countertop. Another frequent complaint of air gap faucet users is noisy performance. Some faucets put out a gurgling sound when the unit is filling its storage tank. Plumbing codes in many areas require the use of an air gap faucet with reverse osmosis units. These requirement are often ignored. We supply air gap faucets upon request but our standard units come with non-air gap models if no air gap request is made. On our Black & White reverse osmosis units, our own brand, we install a check valve in the drain line that prevents back flow. (A check valve is a device which allows liquid to flow in one direction— toward the drain, in this case — but prevents it from flowing the other.) While this modification does not satisfy the letter of plumbing codes that require an air gap, we feel that it provides excellent protection against backflow in a very practical and effective way.